Many thanks, the mode is so great and so fun to play!!! Already good moments during channels and regular server play! Do I dare to ask if it's possible to keep same teams after map restart on a regular server ? It's not an issue if not possible since teams are so easy to reform, but maybe it would be comfortable to keep same teams after restart. Reaby gave me a heads up about this new mode so I tried it with him and some other players yesterday, both in the titlepack and in the program. I love it!!! It gives me similar vibes to when we used to play ManiaTeam back in United, always pushing for a team medal. I played it again today with RedExtra and we had a blast. It's fun to get into a sort of flow with a teammate, almost like you're dancing through the map. Good times! Thanks for this mode! The map "ChaseAttack - White Wine" has a pretty big cut between CP1 and CP2. Just jump to the right at the first jump and do a U-Turn up into CP2. I seen people take off as much as 4 or 5 seconds online using this cut. anyone knows what's new ? It's a small update to the winners UI displayed during the podium. Now in addition to the winners names and statistics, it also displays the name of the map along its creator's name (if it is not a nadeo map). It gives me similar vibes to when we used to play ManiaTeam back in United, always pushing for a team medal. 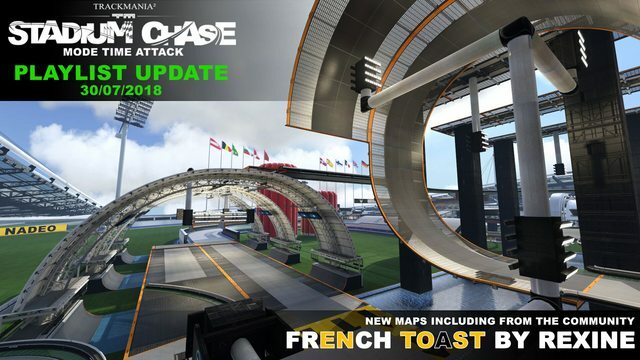 Hello everyone, new playlist tonight with a lot of brand new maps, including one from the community by Rexine called "French Toast"
Hope the original mod will be back.